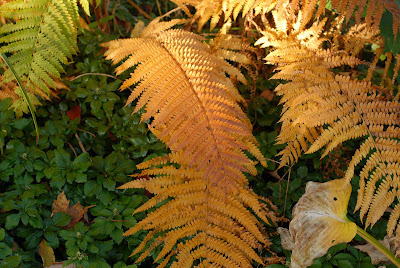 With frosty mornings upon us, here are a few planting tips for lasting fall color in the woodland garden. 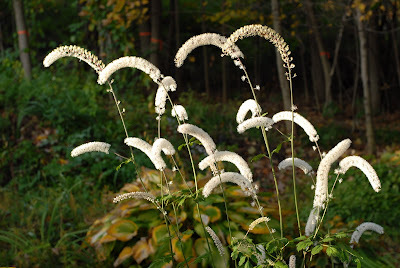 There are a number of blooming plants that hang in there with stunning late-season effect. Here is a winning combination for a shaded area. First, to keep on track with learning about plant families, the Cimicifuga racemosa, commonly known as Fairy Candle is part of the Ranunculaceae family (also known as the "buttercup family"). This tall, late-blooming shade perennial with its showy flower spikes blooms from August to October, depending on the variety. This is a great woodland plant mixed in with ferns, hostas and groundcovers. Because of its height, it is best located in the background. This plant can reach 4-6 feet so position it accordingly amongst your plantings. As the morning chill seeps in, the inspirational gardening thought of the day by William Carlos Williams reminds us we must enjoy what still remains in our gardens. “Some leaves hang late, some fall before the first frost – so goes the tale of winter branches and old bones.” There have been lots of acorns in the woods so if you believe in the old wives tale, we may be in for a long, snowy winter.